Seis de Los Palitos, a variation on the Seis Chorreao, is a traditional dance created by Jibaros in a small town called Villalba. Villalba is located in the mountains, north of Ponce, in a region of Puerto Rico called the Cordillera Central. The town of Villalba is surrounded by beautiful mountains and forests which contain some of the most incredible scenery on the island and Puerto Rico's highest peak! It is said that the Cordillera is the last retreat of the Jibaro, the hardy Puerto Rican mountain peasant who is known for his pride, independence and resourcefulness, a scythe-swinging philosopher. 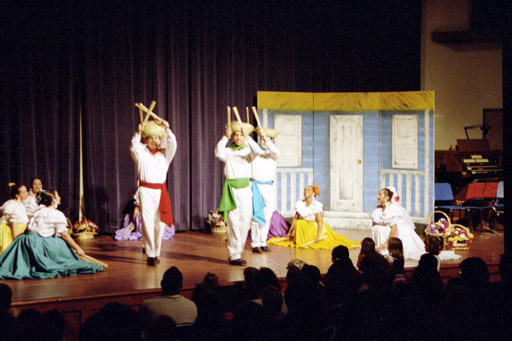 In Seis de los Palitos, the Jibaros hit "palitos" (skinny wood sticks) together, keeping rhythm with the music while they sang and danced.